Badoo Dating Site - Reviews, Cost, all the informations! Meet Singles USA : All about online dating sites with reviews, ranking, tips and how to ! See 0 opinions about Badoo. Created in 2006, Badoo is one of the most visited dating sites in the United States. Indeed, it claims more than 200 million registered worldwide (10 million from USA). It is positioned as one of the leaders of the dating sites. Presentation ! Launched in the UK in 2006, by a Russian businessman, Badoo has quickly surpassed 100 million users across 180 countries in less than 5 years! Today, Badoo boasts more than 200 million users worldwide. It has distinguished itself from its competitors by its typical social network appearance that highlights the profile of members (photo, personal information, etc.). Badoo caters more for the younger generation. 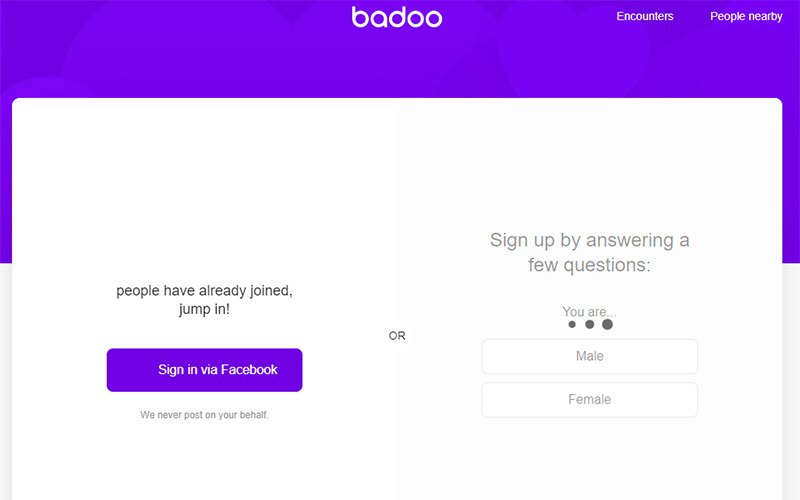 Prices for Badoo subscriptions are below average of other dating sites. Badoo also uses credits as an in-service currency. Users can purchase credits to enjoy a number of perks, such as more visibility, removing feature limitations and others. You can buy 100 credits for 2,99$. Badoo is one of the leaders of the internet dating sites. With its members database and its freemium concept, it differentiates himself from others. Badoo also offers to meet people at any time through a smartphone application. Badoo offers the opportunity to seek new singles, whether it is a serious or friendly relationship. In addition to leaving a comment below, you can give a rating to Badoo by giving it stars. You will help other users. By submitting your review you accept the comments charter.